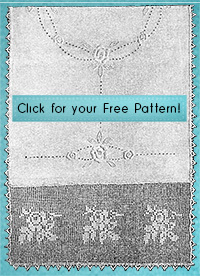 Add happiness to your home decor with this easy crochet pattern for the end of a table runner or dresser scarf. Designed by Mrs. J.C. Campbell in 1918, these bluebirds stand the test of time. Set in a cabbage patch, a stork welcomes a new baby. Featuring the motto “May all your Troubles be Little Ones”, this crocheted lace wall hanging pattern was designed by Mary Card as a pillow cover in 1925. This gorgeous ﬁlet crochet centerpiece is constructed by adding lace triangles to a square of fabric. Sew the large triangles to your fabric square, crochet smaller triangles along the resulting straight edges, add the included fancy picot edging, and you’re done! Designed by Mrs.